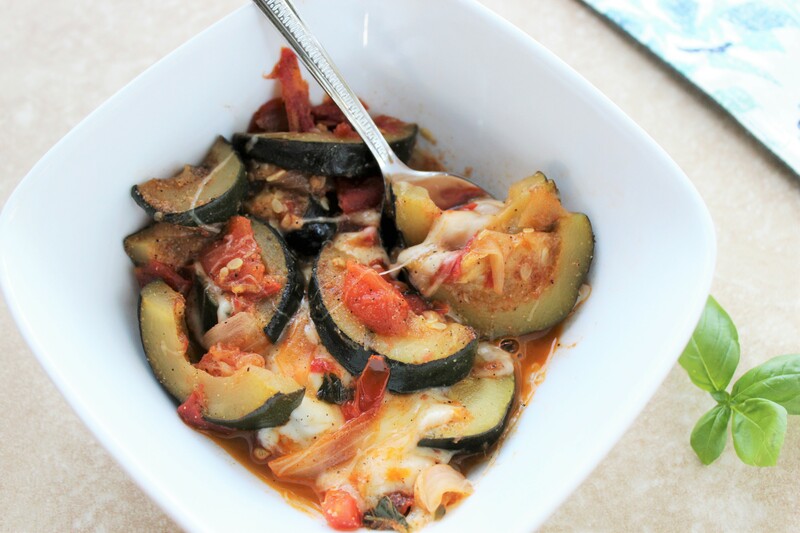 Why is this Tomato, Zucchini, and Mozzarella Bake so good? Because, CHEESE. Really, that’s the best part. When is cheese melted on vegetables not a good idea? And I’ve got to give the veggies credit, too; they are flavorful themselves. It’s a very savory, very satisfying combination. I can’t take credit for this one. My mom (thanks, Mom!) used to make a version of this as a summer side dish all the time when I was a kid. She always used muenster cheese, making that an excellent substitution for the mozzarella if you’d prefer (cheddar would work pretty well, too). 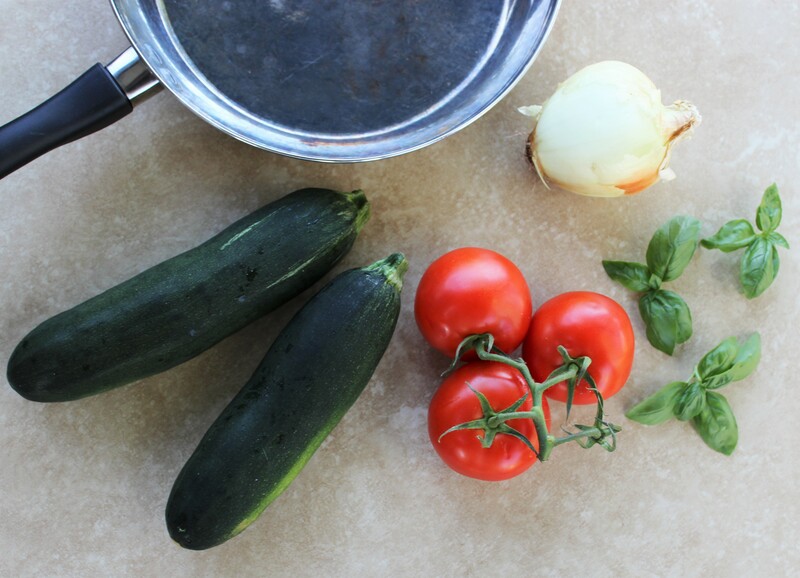 Hers, from what I can recall, was a more simple recipe consisting of the tomato, zucchini, and cheese itself – and probably some salt and pepper. I don’t think she had onion in hers, but mine does; it lends great flavor, as does the basil, which I also added. While this recipe makes a great side dish, you can seriously make a meal for two out of it. You might tell yourself you are only going to eat a few spoonfuls right after making it and just keep going – as I have a time or two. I’m telling you, it’s addictive! Not only that, but the tomatoes are chock-full of delightful nutrients such as Vitamin C and antioxidants lycopene and beta-carotene. Bonus! I was amazed by the wide array of wellness benefits that these little guys offer, as outlined in Well-Being Secret’s awesomely comprehensive post, “29 Science-Backed Health Benefits of Tomatoes.” Check it out! This and Well-Being Secret’s other posts are super informative. They’ll remind you that eating healthfully is more than just a check-box on your should-do list: it’s a critical part of keeping your body running at tip-top condition. And it’s delicious, to boot! 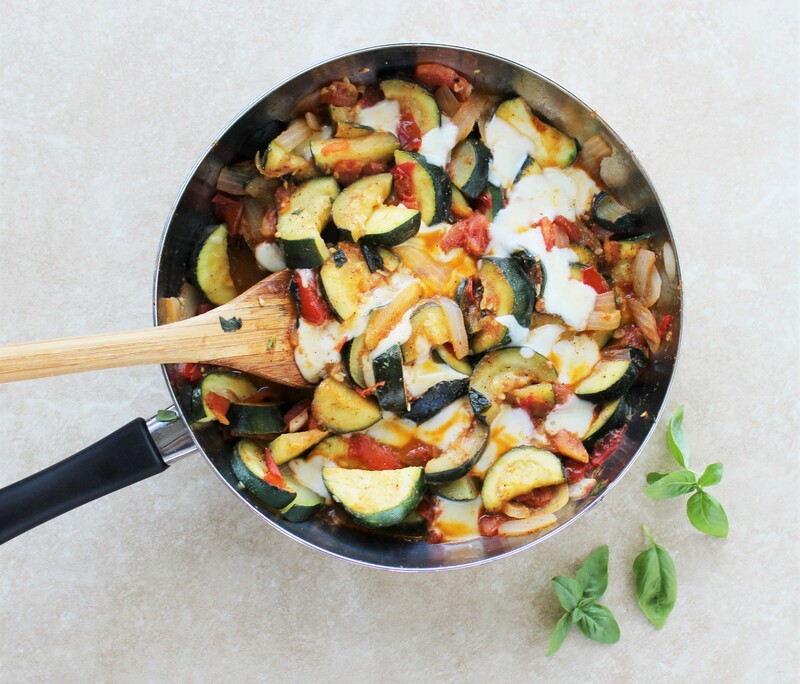 So get to cooking – and enjoying – this Tomato, Zucchini, and Mozzarella Bake! Coat a large frying pan with the grapeseed oil; add the zucchini and saute for five minutes over medium heat, stirring occasionally. Add the onion and saute for an additional five minutes, continuing to stir here and there to ensure even cooking. Then add the tomatoes, basil, and spices and cook for an additional 10 minutes, or until all vegetables are well softened. Spread the cheese cubes evenly over the pan contents and let sit for a moment or two until melted. Serve immediately. Makes four side servings.